Wilson Audio Duette review | What Hi-Fi? Talk about aiming high: the Duettes are officially Wilson's entry-level speakers, though this could possibly be the only time in your life you see the words ‘entry level' next to a £9350 price-tag (the other £1650 is for the stands). But put away your assumptions: the Wilson Duettes are truly something special.Most high-end speakers make certain demands on your room. The vast majority of them need a fair bit of free space to stand in if you want them to work at their best. But these Wilsons are specifically designed to offer a serious degree of placement flexibility rarely seen at the high end.Interestingly, each speaker comes with a discreet, external crossover for each box, and a supplied cable to connect the crossover to the loudspeaker itself. And you have two options here: one cable is marked ‘free space', while another is marked ‘close to wall'. They also come with two separate resistors, which can be easily fitted to the cross­over by you or your dealer, depending on which placement you're going for. And if you do optimise them for operation close to a back wall, the good news is, they really do work. The Duettes sit on their dedicated stands via a set of small metal support cones, which are positioned precisely due to a clever magnetic design. You can also position them horizontally, should you feel the need.So far, so much neat and clever high-end design. 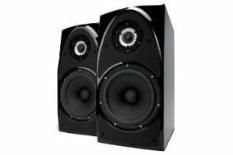 But justifying a price tag such as this for a pair of relatively compact speakers is all about performance. So, the question is, do they live up to their promise? The simple answer is ‘yes'… with bells on… and then some! First of all, there's the soundstage – huge, spacious and full of vibrant detail, they project a sound into the room that makes a mockery of their size. with top-and-bottom tonal extension that delivers a stupendously cohesive sound. There's loads of air and space at the top, and deep and punchy bass at the low end of the spectrum.Timing is also razor sharp, rendering the indie/ska/dub fusion of the Santogold with an unrelenting grip of the bombastic rhythm tracks. There are few products that, once we're sure of a verdict and have essentially finished reviewing them, force us to keep going for the sheer pleasure of listening to them. But the Wilson Duette speakers are just such products. Eleven grand and great value for money? You bet!